A timeless relic … ummmm … I know this … it’s a wall phone! … no, no … a phone in a box on a wall? Great shot, Carin. 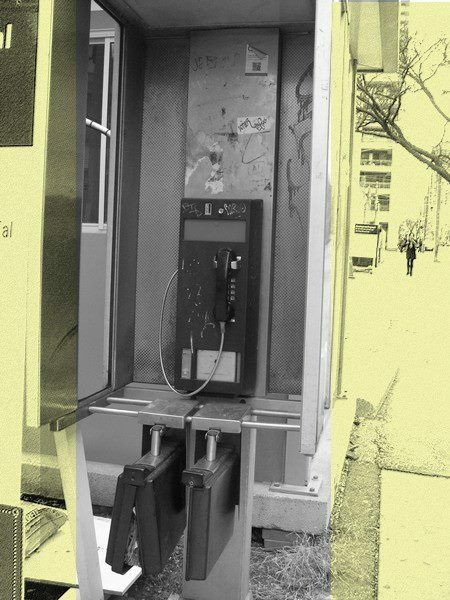 Yes, I’m sure that’s what they called them… used to be everywhere but I’m trying to think: who did we used to call from these phones in boxes on walls?? My goodness that “speaks” volumes (not to mention the volumes of phone #s so conveniently stashed below where — if experience means anything — the page with the # one is looking for will have been torn out!). A great and poignant shot, made more so by the way you managed to make the background “yellow” which I have no idea how you did. If one even dared to ‘touch’ those books… How in heaven’s name did they ever ALL get so grotty? What’s that? Ha, ha just kidding. I’m not sure how you did it but I love the mural effect you’ve created with the yellow and black. You do such a wonderful job of capturing ‘the ordinary’, Carin. How quaint love the pull out seats heheh! Funny that you mentioned Fawlty Towers in your comment over at mine because the episode you referred too was shown again only the other night on Gold heheh! I love how you see things.